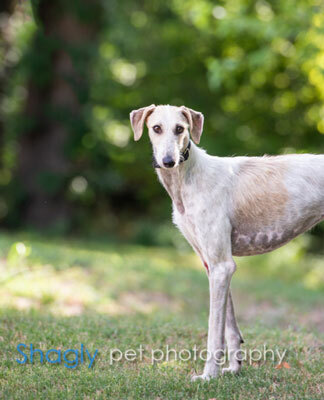 Esther is an estimated one year old white/fawn tiny fuzzy greyhound mix. She was found as a stray in Lubbock, and her rescuer immediately contacted GALT. There is no way to know what Esther has been through, as she has quite a few old wounds and scars all over her body. She is quite a cuddle bug! Esther has a positive titer to Ehrlichia Canis, and her treatment has begun. Esther has been determined to be small animal and cat tolerant. UPDATE 2/16/2019: Esther is now ehrlichia free. 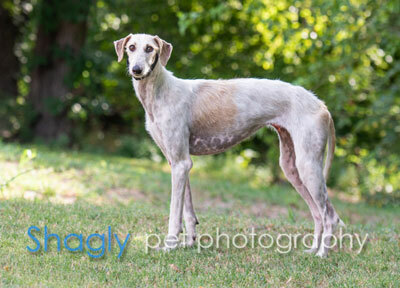 Esther is a sweet little greyhound mix who has been with her foster family for three months. She gets along great with her foster Lab sister and brother. She is playful and loves her toys, but she is also happy to settle down and have some quiet time. She rides pretty well in the car, much better on the return side than the initial trip. She walks well on a leash and enjoys being outside her home. When nobody is home, Esther is crated and does well in her own space. She loves to cuddle with other dogs and people. She likes both young and old. Esther can be trusted with small animals, guinea pigs, cats, and chickens, but she does enjoy a good squirrel chase in the backyard. Esther will make a wonderful addition to a family who is willing to spend time with her and provide the care this little gal deserves.